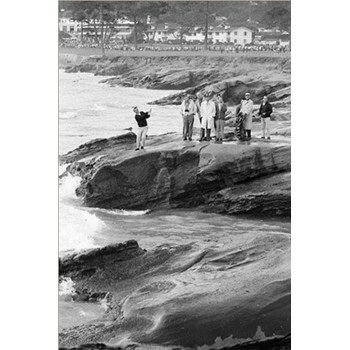 In 1963 & 1964 Arnold Palmer was wiped out of contention at Pebble Beach when shots were fired into the rocks on the par three 17th hole. At the time, local rules defined the rocks as "part of the course." This photo was taken on January 18, 1964 during the Bing Crosby Pro Am. This 11" x 14" black and white historic photograph has a sepia tone.